Mumbai, Maharashtra, India/Businesswire India//– Medtronic plc (NYSE:MDT), declared a partnership between India Medtronic Private Limited, its wholly owned subsidiary in India, and Cardiological Society of India 2018 (CSI 2018) to drive awareness and training to perform Cardiopulmonary Resuscitation (CPR), also simply known as ‘a technique to revive heart and lungs’, in public places. The training aims to increase awareness about managing the first few crucial minutes after someone has suffered a sudden cardiac arrest by performing CPR and automated external defibrillator (AED) usage. The two organizations announced a partnership in Mumbai on ‘World Restart a Heart Day’ – 16th October 2018. 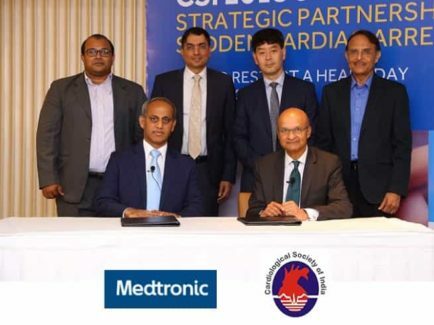 The partnership document was signed by Omar Ishrak, chairman and chief executive officer of Medtronic and Dr. Prafulla Kerkar, organizing secretary, CSI 2018 and head of the Department of Cardiology at the King Edward VII Memorial Hospital. Cardiological Society of India (CSI) was started on the 4th April 1948 at Calcutta. It has twenty-five branches of its own spread all over the country. CSI is an active member of the International Society & Federation of Cardiology and Asian Pacific Society of Cardiology and SAARC society of Cardiology and jointly working with European Society of Cardiology (ESC) and American College of Cardiology (ACC). The present membership strength of the Society including overseas members has reached more than 4000. Medtronic plc, headquartered in Dublin, Ireland, is among the world’s largest medical technology, services and solutions companies – alleviating pain, restoring health and extending life for millions of people around the world. Medtronic employs more than 86,000 people worldwide, serving physicians, hospitals and patients in more than 150 countries. The company is focused on collaborating with stakeholders around the world to take healthcare Further, Together.